A GAO report examines the effectiveness of Transportation Security Administration methods. 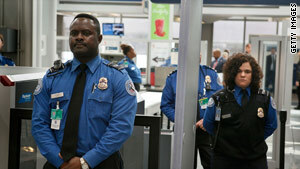 Washington (CNN) -- A new report, due Thursday, raises questions about the Transportation Security Administration's ability to keep airports safe from terrorists. The report by the Government Accountability Office casts doubts on TSA's ability to adequately perform its security mission, said U.S. Rep. John Mica of Florida. Mica specifically wanted the GAO to determine how effective the TSA's behavior detection program, or SPOT (Screening Passengers by Observation Techniques), has been in deterring potential acts of terrorism. Mica will unveil the results of the report at a press conference, he said. As chairman of the subcommittee on aviation after the September 11, 2001, terrorist attacks, Mica was instrumental in establishing the TSA. Now, he says he is a critic of its ballooning bureaucracy.